Is it a mere staircase, or is it a stairway to heaven? Good design and interesting materials make the difference. If your house plan is on more than one level, you’re gonna need steps. But there’s no reason they have to be either boring or hidden. 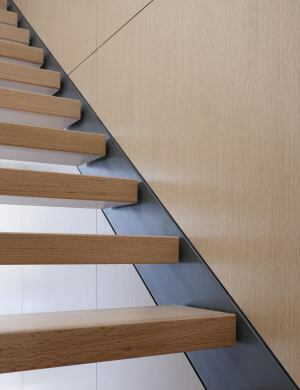 With the right materials in the mix, a good-looking stairway can become a memory point inside the home. The front and back exterior walls of this contemporary city home are all glass, allowing views through the entire house to the courtyard. Lateral steel made it possible to eliminate interior walls that would otherwise obstruct the view, but that made the stair assembly a challenge. “The floating stair is composed of two steel channels that are facing away from each other and notched/bolted into the structural wall framing,” explains builder Jake Goldberg. “Half inch thick steel plates are welded between the channels. These plates receive the millwork sandwich treads and structurally help tie the entire building together. The original concept for the stringers was to have them reversed (facing inward) and mostly covered by drywall and wood panels. Flipping them around and expressing the steel eased and simplified the assembly, reduced costs, and resulted in a very elegant outcome.” The design incorporates wall panels of reconstituted oak veneer and treads of rift-sawn oak.